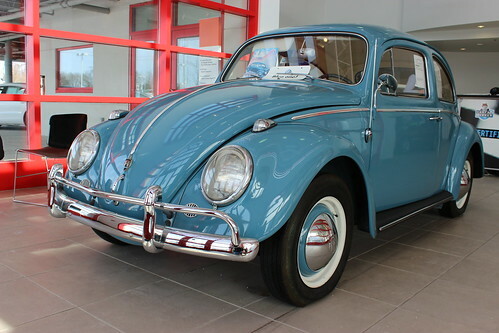 Volkswagen Beetle, the iconic car from Volkswagen is one of the most popular cars of all time. It was manufactured by Volkswagen from 1938 until 2003. During that time more than 21 million of them were made. In 1972 the Volkswagen Beetle replaced the Ford Model T as the top selling car in the world. Ferdinand Porsche, automotive engineer, submitted a design for a people’s car, a ‘Volkswagen’ to the new German Reich government in 1934. He was awarded a contract to produce the car by Adolf Hitler. Production was interrupted by World War II but in 1954 one million Beetles were produced. The Volkswagen Beetle ceased to be manufactured at its main factory in Wolfsburg, Germany in 1974. However the car continued to be manufactured at smaller plants in Germany and in countries around the world, including Ireland. Large manufacturing plants in Brazil and Mexico continued mainstream production of the Beetle until 2003. The last of the ‘old style’ Volkswagen Beetles rolled off the assembly line in Puebla, Mexico in the year 2003 On This Day. 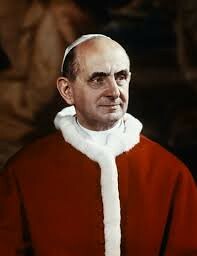 Humanae Vitae is an encyclical which was issued by Pope Paul VI in 1968. In the encyclical the Pope reaffirmed the Catholic Church’s ban on the use of contraceptives. He reaffirmed the ban despite a recommendation for change by a Church Commission established by Pope John XXIII. The encyclical was controversial and divisive. It was welcomed by some but for the first time in history a large proportion of the laity openly dissented from the teachings of the church. It is argued that the encyclical marked the beginning of the decline of the influence of the Catholic Church. Humanae Vitae, which reaffirmed the Catholic Church’s ban on the use of contraceptives was issued by the Vatican in the year 1968 On This Day. Tupperware is a range of food preparation and storage products for the home. The product was invented by American businessman Earl Tupper in 1942. He used a waste product from oil refining to make lightweight, non-breakable containers. Today Tupperware is sold by direct marketing in over 30 countries around the world. Earl Silas Tupper was born on his family’s farm in New Hampshire, USA in 1907. Having graduated from school he established a landscaping business. He later worked for the Du Pont chemical company before establishing the Tupperware Company in 1948. Tupperware was initially sold in stores. However following the success of Brownie Wise’s ‘party-plan’ marketing it was decided to sell Tupperware products by direct marketing. Today the products are sold by almost 2 million people in over 30 countries. Tupper sold his company and retired to Costa Rica in 1973. He died aged 76 in 1983. Earl Tupper, the founder of Tupperware was born in New Hampshire, USA in the year 1907 On This Day. Bob Hope was born Leslie Townes Hope in London, England on May 29th 1903. When he was four years old he emigrated with his family to the United States. He grew up in Cleveland, Ohio where in the early 1920’s he began his career in show business. He performed on Broadway in ‘Sidewalks of New York’ in 1927. 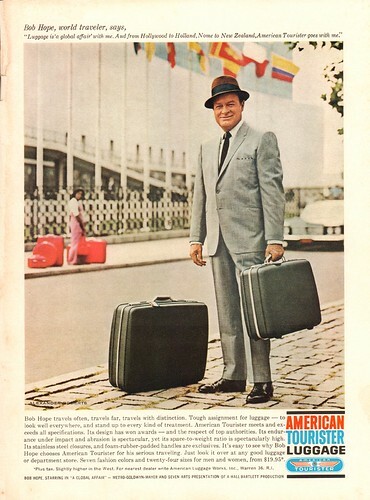 During his career Bob Hope appeared in over 70 films. He also performed in a large number of television programmes and stage productions. He was the host of the Academy Awards on nineteen occasions. He was the recipient of several awards including five Academy Awards. He was conferred with over 50 honorary degrees and in 1998 he received an honorary knighthood. Bob Hope died in Los Angeles, California at the age of 100 in the year 2003 On This Day. Stephen Roche is a former champion road racing cyclist who is a native of Dublin, Ireland. He was the first Irishman to win the Tour de France. During his 13 year professional career he had a litany of successes and was the winner of the triple crown of victories in 1987. In that year Roche won the Tour de France, the Giro D’Italia and the World road race Championship in Villach, Austria. Stephen Roche was born in Dundrum Co Dublin on November 20th 1959. He was the youngest ever winner of Rás Tailteann in 1979. In 1980 he represented Ireland at the Olympic Games in Moscow. 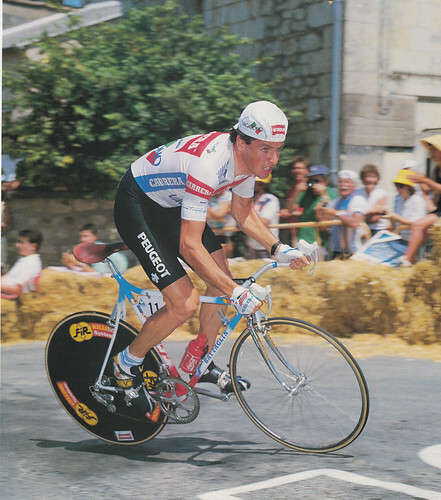 In 1981 Roche turned professional and had ten victories in his first year. Despite injury he continued to win races culminating in his Triple Crown of victories in 1987. He continued to race until his retirement in 1993. Stephen Roche became the first Irishman to win the Tour de France in the year 1987 On This Day.